2. Roll out pie crust and lay into a 9-inch pie pan. 3. Combine almonds, brown sugar, oats, flour, and salt in a large bowl. Work butter into the almond mixture with your fingers, breaking up any large pieces, until incorporated completely. Cover and chill for 15 minutes. 4. Combine cherries, lemon juice, white sugar, and cornstarch. Stir until well coated and no dry lumps remain, 3 to 4 minutes. 5. 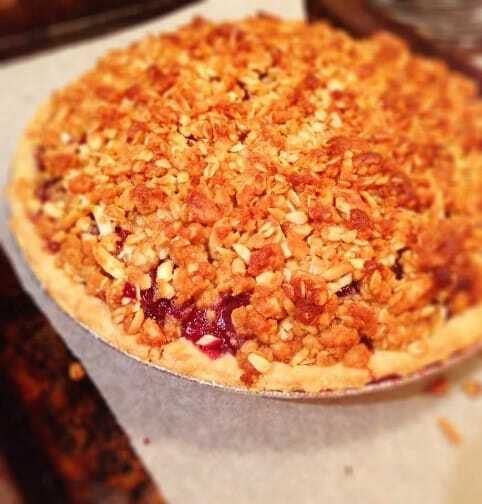 Pour cherries and any accumulated juices into the prepared pie pan. Press down into the pan. Crumble oat mixture over the top. Place the pan on the prepared baking sheet. 6. 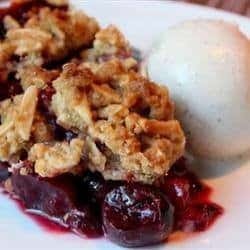 Bake in the preheated oven until cherries are bubbling and the crust and crumble topping are browned, about 1 hour 15 minutes. Let cool completely.